Much water has flowed under the Cuddy Brig since the first publication of St. Ronan’s Well by Sir Walter Scott in December 1823. No one, least of all the author himself, could have envisaged the effect the novel would have on a then remote and secluded Borders village of weavers and herdsmen. No doubt Innerleithen today would have its annual festival in common with other Borders towns but it is highly unlikely it would be called “St. Ronan’s Border Games”, nor would we have our unique Cleikum Ceremonies. St. Ronan’s Well was the only novel Scott set in his own time. It is a tale of idle, decadent gentry and pleasure seekers who seasonally frequent a “spaw” somewhere in the south of Scotland. Scott was a genuine superstar and such was his prestige and popularity that the novel, in common with most of his other works, quickly sold well, particularly north of the border. Although the description of the landscape in the story bore little resemblance to the actual environment of the town, “St. Ronan’s” quickly became identified with Innerleithen. John Gibson Lockhart, Scott’s son-in-law and first biographer, wrote, “. . . the book . . . was rapturously hailed by the inhabitants of Innerleithen . . . who . . . foresaw in this celebration a chance of restoring the popularity their long neglected Well”. It worked too! Soon “an unheard-of influx of water-bibbers” invaded the town and the rest, as they say, is history. Lockhart did not seem greatly enamoured of “the spruce hottles, and huge staring lodging houses” that were built to accommodate the visitors. In his mind they tarnished the idyllic scene “that had induced Sir Walter to make Innerleithen the scene of a romance”. There were no planners to worry developers in those days! Local place names such as Waverley Road, Ivanhoe and Marmion House are, however, reminders of the esteem with which the town’s inhabitants regarded Scott. To gain a sure and nearer look. Sir Walter gave me as he passed. Of our Great Wizard, Walter Scott. 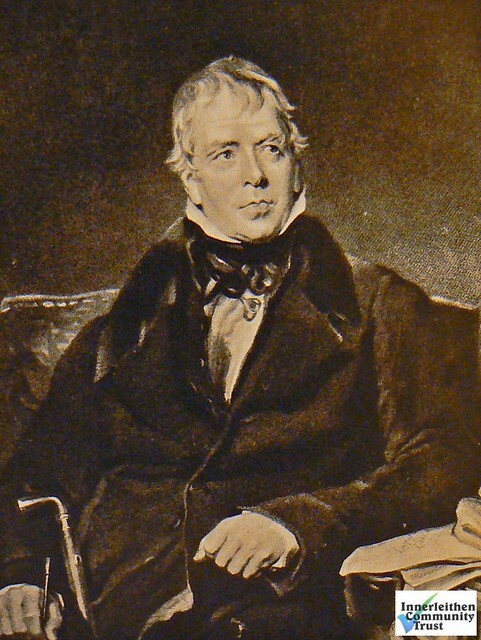 This simple doggerel gives some inkling of the tremendous regard in which Sir Walter Scott was held. We in Innerleithen should also hold his memory in the highest esteem and never forget why his name is on the Games banner. But for his genius there might never have been a Games Week.